The UNC Center for Bioethics would like to welcome our new Visiting Scholar from the University of Zurich, Institute for Bioethics, Matthias Eggel. Dr. Eggel will be with us from January 16 – March 10, 2018. 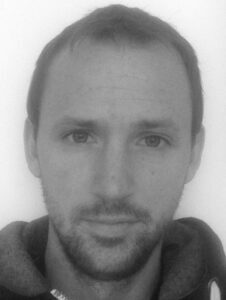 Currently, Dr. Eggel is pursuing a PhD in bioethics, and holds a PhD in molecular biology and biochemistry from the University of Berne. His work is on research ethics with a focus on genomic editing and animal ethics. 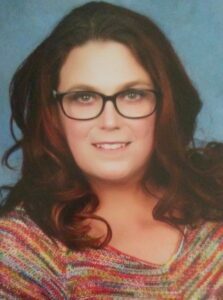 The UNC Center for Bioethics would like to welcome our new Center Coordinator, Brandy Elsenrath, starting with us on January 8. Brandy started working at UNC-CH in 1999. She has held positions within the UNC School of Medicine, UNC Property Office and most recently in the UNC School of Nursing. Please stop by and welcome her to the Center! A new clinical ethics elective joins the TEC Individualization Phase curriculum this spring. It offers medical students an opportunity to focus their interests in clinical ethics on a particular practice area, using mentorship, scholarly readings, and practical experience with the hospital ethics committee to gain practical experience and sharpen their skills in ethical reasoning. The elective has been developed by a new member of the Hospital Ethics Committee, Dr. Liz Sonntag. 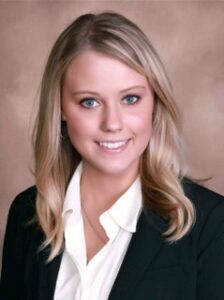 Dr. Sonntag is a Pulmonary and Critical Care fellow who completed her undergraduate specialization in Bioethics and Humanities before moving on to medical school where she served two terms on the American Medical Associations Bioethics Committee. She recently finished Fellowship at the MacLean Center for Clinical Medical Ethics at the University of Chicago where she also served as an ethics consultant. Arlene Davis, Center faculty member and Director of Clinical Ethics Services at UNC Health Care, serves as faculty for this elective. 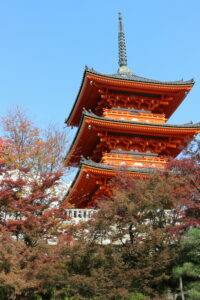 Eric Juengst participated in two workshops on behalf of the ELSI 2.0 International Collaboratory for Genomics and Society Research in Kyoto, to discuss cross-cultural perspectives on clinical genomic sequencing, research data-sharing, and dynamic consent, with colleagues from Japan, Australia, Singapore, Korea, Germany, and the UK. The ELSI 2.0 Collaboratory was founded at the 2011 NIH ELSI Congress in Chapel Hill to facilitate international research on the ethical, legal and social implications of advances in human genomics and genetics, and is open to all. (https://elsi2workspace.tghn.org/). 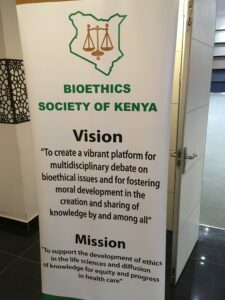 In a recent trip to Kenya, Professor Stuart Rennie visited the capital city of Nairobi with the purpose of participating in and presenting a paper at the 2nd Annual Kenya Bioethics Society conference. The paper was entitled ‘Perceptions of benefit among research participants in Kenya: ethical implications’, and is based on a qualitative research study led by the Kenya Medical Research Institute (KEMRI), Pacific Institute of Research and Evaluation (PIRE), and UNC. The study in Kenya revealed that research participants believed involvement in adolescent HIV research has a number of important benefits apart from any study intervention (i.e. ‘inclusion benefits’); the paper presented focused on the significance of these benefits for ethical assessments of research. As part of this trip, Professor Rennie worked as consultant for a newly funded National Institute for Health-Fogarty International Center bioethics training grant at KEMRI. Dr. Rennie’s role as consultant was to provide input on design and implementation of the program, as well as curriculum development, based on his experiences in similar Fogarty bioethics projects in the Democratic Republic of Congo, Madagascar and South Africa. In November 2017, the Pregnancy and HIV/AIDS: Seeking Equitable Study (PHASES) project convened an international workshop in Bangkok, Thailand to address ethical issues in the inclusion of pregnant woman in HIV/AIDS research. This one-day series facilitated sessions and discussions in Bangkok, Thailand by bringing together select participants of the 2017 Global Forum on Bioethics in Research (GFBR) and other invitees from a variety of countries, cultures, and disciplinary perspectives to help develop an international framework for ensuring that the health needs of pregnant woman and their future offspring are appropriately addressed in HIV/AIDS research agenda. Kristen Sullivan and Elana Jaffe, from the UNC PHASES staff, hosted this workshop. 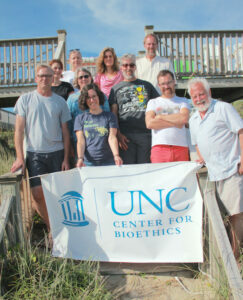 On September 18-21, 2017, the C:B faculty decamped to Emerald Isle, NC, for three days of intellectual engagement with each other’s work in progress. Participants submitted manuscripts in advance and, after a “reading day” on Thursday, spent Friday and Saturday discussing each others’ papers – in between beach walks, collaborative cooking, and ill-advised attempts at surfing. In addition to Center faculty, three guests enlivened the experience: Maria Merritt, Ph.D., from the Berman Institute for Bioethics at Johns Hopkins University, Carl Elliott, Ph.D., from the U. of Minnesota Center for Bioethics, and Chris Simon, Ph.D., from the Trent Center for Bioethics and Medical Humanities at Duke University. Special thanks go to Rebecca Walker, who was the driving force behind this unique event. The Center was honored to host Wylie Burke, MD, Ph.D., Emeritus Professor and former Chair of the University of Washington Department of Bioethics and Humanities, as our 2017 Merrimon Lecturer, the School of Medicine’s oldest and most prestigious endowed lectureship., from October 3-6. 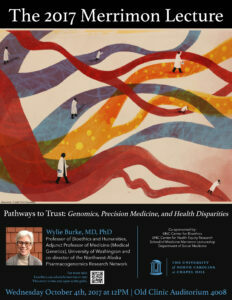 During her Oct.3-6 visit, Dr. Burke delivered her lecture, “Pathways to Trust: precision medicine, genomics, and health disparities” to an audience of 300 students and faculty and met separately with students, trainees and faculty from eight different UNC programs: the Center for Health Equity Research, the Center for Genomics and Society, the UNC American Indian Center, the School of Medicine’s Clinical Ethics Discussion Group, the Center for Bioethics, the Community Engagement Core of the NC Translational and Clinical Sciences Institute, and the student-led Coalition for Dismantling Medical Racism, as well as providing a guest lecture for MS3 medical students on genomic sequencing in the clinical context. She was in great demand, and met the challenge with characteristic energy and wit. Thanks so much, Wylie!